Maxwell has a small addiction to stickers. This week Maxwell has been having a lot of fun outside. Maxwell and I have been out and about a lot and we have spent some time going to a few of our local parks. We are lucky where we live and around us we have around 3 parks which are walking distance. Maxwell's favorite park has a choice of two slides, a car, swings and other play equipment. This week we decided to hike there and Maxwell had tons of fun, on our way back Maxwell had lots of fun jumping in puddles! Maxwell's speech has been a big concern of mine recently, I have been loosing sleep over it and worrying madly. On Friday we went to see a speech therapist, who along with another lady decided that although Maxwell did have a delay, it was nothing major and they would hope he would not be on there books for long. It was a great session and it was a huge relief to know there was very little wrong with Maxwell. We have a few activities which we need to do at home to encourage Maxwell's speech and the speech therapists will be attending Maxwell's nursery sessions in a few weeks time to see how he is getting on. This week we celebrated my Grandads 86th Birthday which meant we got to see my parents when we visited my Grandad. It was brilliant to spend time with my parents and Grandad and Maxwell really enjoyed himself. He spent hours playing bat and ball with my Dad and he loved giving cuddles to my Mum. My Grandad also seemed to enjoy himself, he was very spoilt with presents and was also given a large amount of cake! Now it is nearly Autumn time, I am looking to update Maxwell's wardrobe. 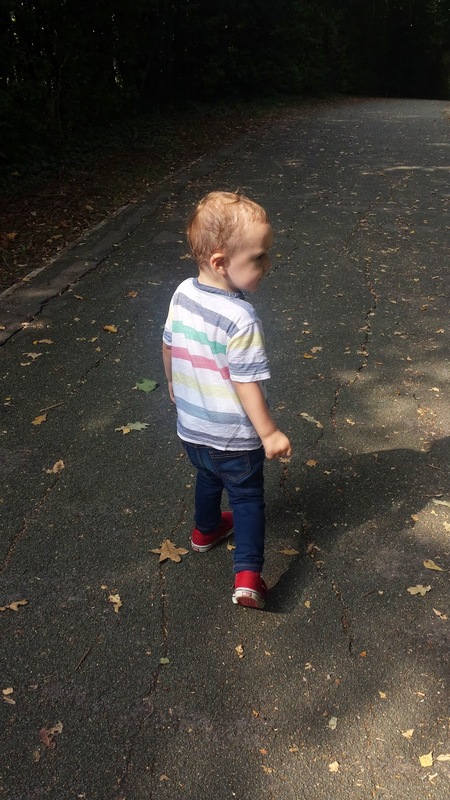 Yesterday I wrote about a few items I would love to buy for him to keep him looking cool and trendy but this weekend will see us hit the shops and get Maxwell some new Autumn clothing. We will also be visiting Clarks to get him some shoes which will be suitable for him to attend preschool in as I would hate him to go in his Converse trainers and allow his feet to get wet and muddy. We are looking to buy Maxwell some nice leather shoes that will be suitable for him to wear at preschool but also suitable for him to walk to preschool in. We will also be looking to buy him some spare wellies to keep at preschool. Maxwell has a big sticker addiction, this week we have seen Maxwell complete a sticker book, a activity book full of stickers and use lots of stickers out of 2 magazines. It is great he has started to show a interest in stickers and I am looking forward to this week, when I am able to show him that stickers can be made into art work.